On July 21, I will create a 24-page zine from conception to final product in 24 hours straight. 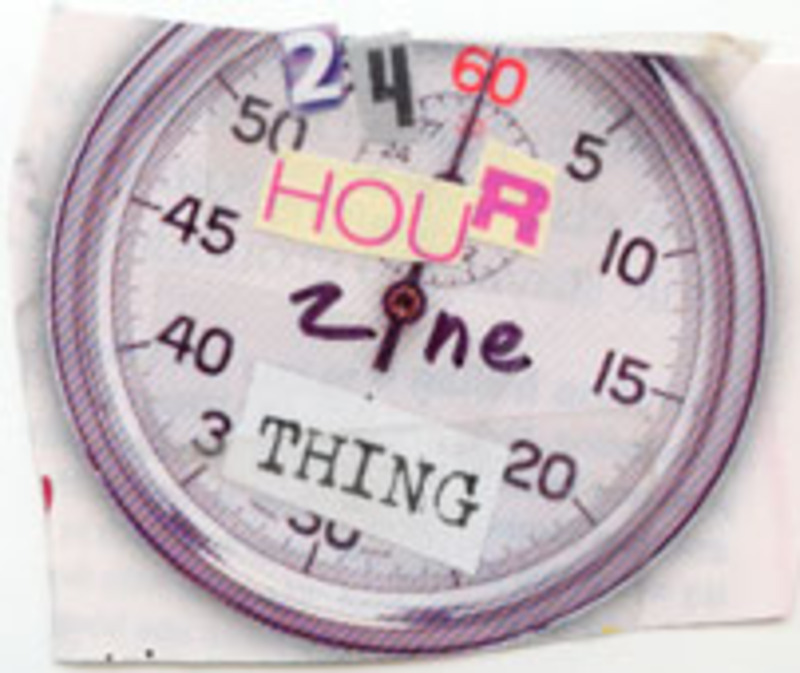 You can participate in the 24 Hour Zine Thing challenge too. Pick a day in July and make a zine! July is International Zine Month. in its Summer 2012 issue. especially the Haiga Gallery, Cherry Blossoms and Basho’s Frog episodes. Let yourself be transported by the beautiful sights and sound of this haiku podcast. Entry is by mail only. Minispeech, Tanka Poetry reading etc. 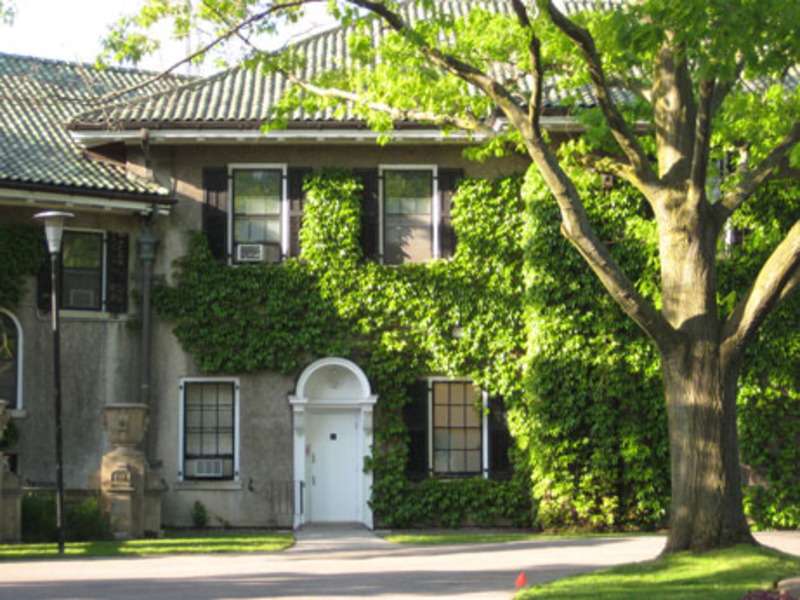 The Haiku Canada weekend took place at the York University Glendon College in Toronto from May 18 to May 20, 2012. 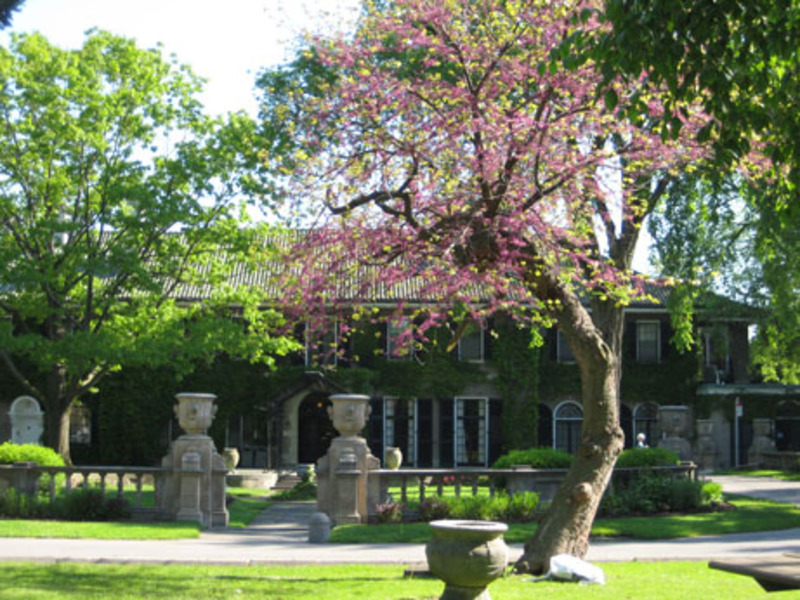 All the activities took place in the ballroom of the Glendon Manor(yes, a manor! ), a beautiful building with cobblestone, a garden at the front and a rose garden in the back. 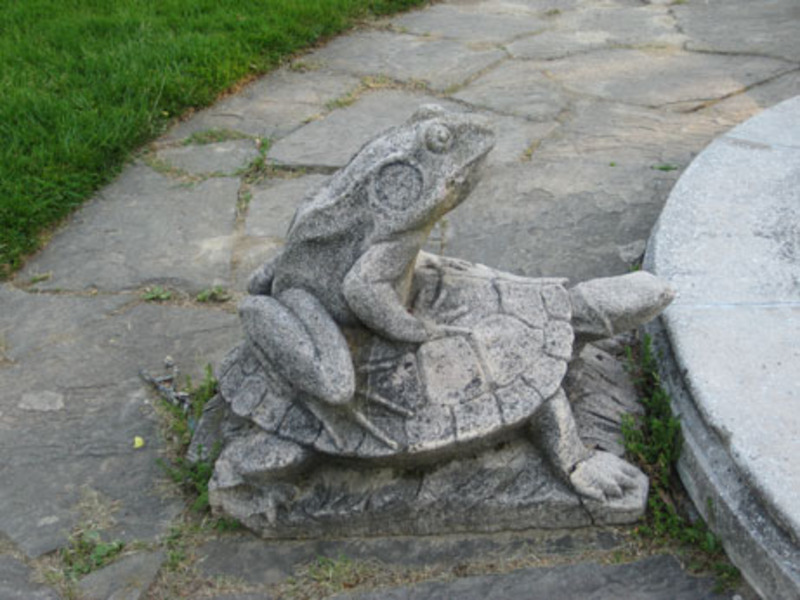 In the rose garden, garding the fountain was stone frog sitting on a turtle`s back which captivated all the haiku poets, of course. After checking in, the haiku poets mingled and enjoyed some refreshments. At 7pm we started assembling the Holographic Anthology. (For those not familiar with the Holographic Anthology: all poets had to submit 102 copies of one haiku handwritten and signed. Playing cards, memo, 1 dollar bill, gingko leaves, flags were some of the medium used by the participating poets). Even with 15 poets helping, it still tookabout 2 hours to assemble all the copies. People who submitted to the anthology received their complimentary copy on the spot (other contributors will receive one copy in the mail). One of my favourite activities at Haiku Canada is the night renku lead by Marshall Hryciuk. On the first night, with a dozen poets participating, we manage to complete 36 links between 9.00pm and 12.30pm. 9.00- Anonymous Haiku Workshop, Terry Ann Carter and Nick Avis. 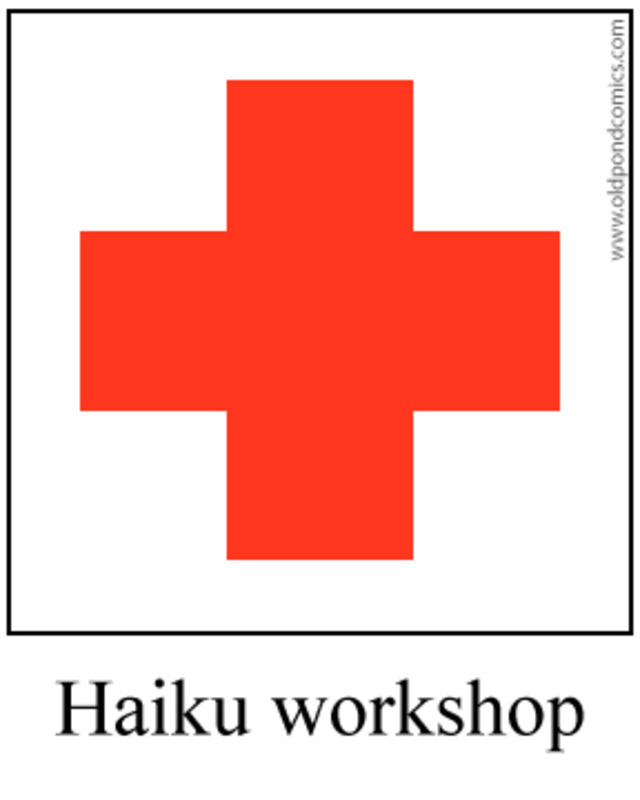 – read your haiku out loud (even visual poetry). The sound is important. 11.00-11.30 Makato Nakanishi on Haiku by Japanese High school students in Haiku Koshen. Japanese students think haiku is hard to understand and to compose. In the Haiku Koshen competition, 2 teams of 5 members each (red versus white) read one haiku each and then have to face a cross-examination from the other team (is the haiku good or bad, etc.). After the cross-examination, the judge vote (with a red or white flag) to designate a winner. In 1998, 9 team participated from 9 schools. In 2011, 124 teams participated from 76 schools. 4.15-5.15 Francophone poets Luce Pelletier, MichelineBeaudry, Huguette Ducharme were invited to read by Master of Ceremony Mike Montreuil. I read from Janick Belleau’s D’Ames et d’Ailes since she couldn’t be there with us. (Her tanka book which won the Canada-Japon award). 3:30 – 4:15 pm Haibun: The Bad and the Beautiful by Roberta Beary (editor for Modern Haiku). – don’t read Narrow Road to the Deep North andcopy it. You have to have an original voice. In short, she says, a good haibun=good title, good prose,good haiku. She notes that she likes the haibun published in Notes from theGean. 8.00 Haiku Canada was celebrating its 35thanniversary this year and, during the launch of the annual HC members anthology, we were able to re-live the creation of Haiku Canada through stories and photos of its first founding members: LeRoy Gorman, George Swede, Marco Fraticelli, MarshallHryciuk who were meeting back then at the house of the late Betty Drevniok, and later on met at the Monastery. The new HC Anthology features one page per member (a bio and 2 haiku per poet). All HC members will receive a free copy in the mail. 10.30pm-1.30am Night renku lead by Marshall Hryciuk. The second night was more difficult. As more people went to bed early, a small group of us (5-6) was left to find links to difficult verse like ”kokopelli`s flute”. At the next table, the Living Legends of Haiku Canada (as Marco Fraticelli called them) were at a separate table laughing and talking excitedly. “What are they doing?” I asked. “They’re doing an anti-renku.” answered Melanie Noll. “What’s an anti-renku?” “A renku that doesn’t have any rules and doesn’t have to make sense”. I wanted to join their table badly as we struggle to find a verse to link to “kokopelli’s flute”. As we were starting verse 22 (out of 36) a sudden cry of victory came from their table (courtesy of Anita Krumins): “We are finished. We have 36 verses. La la la!”. The Living Legends (George Swede, Anita, LeRoy Gorman, Nick Avis, etc.) then went to bed and the room got suddenly very quiet as we struggle to find links to yet another difficult verse. Movement: fist to the hip (rosehips), fist to the side (roses), fist higher up (buds),arm brushing/extending to the side (on the same branch), arm moves up (august)and down (evening). 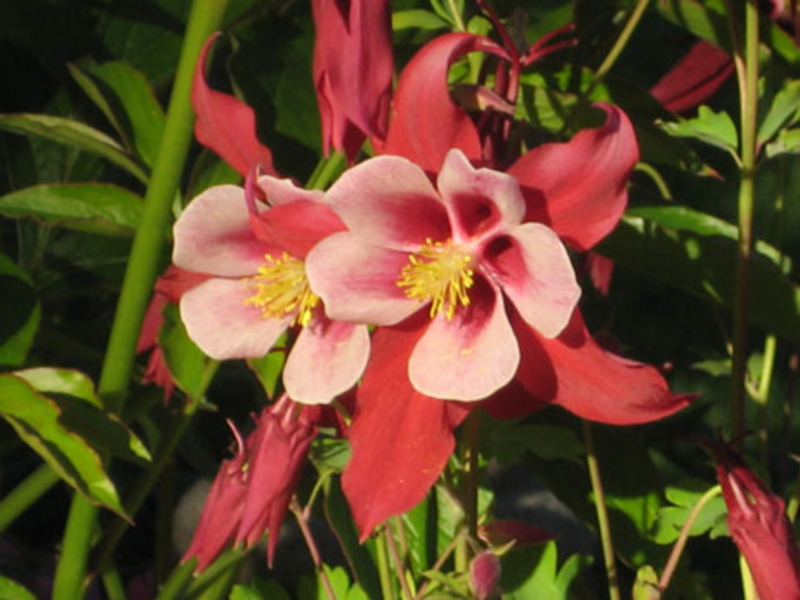 The movements had the simplicity and beautify of haiku. A beautiful haiku performance! Usually, after a haiku conference, I suffer from haiku overdose and it usually takes me a couple weeks (sometimes months) to get to the piles of books I brought back. However, as soon as I got back home, I immediately read Mike Montreuil’s book of haibun “The Neighbours are Talking”. Mike Montreuil is one of my favorite haibun writer. 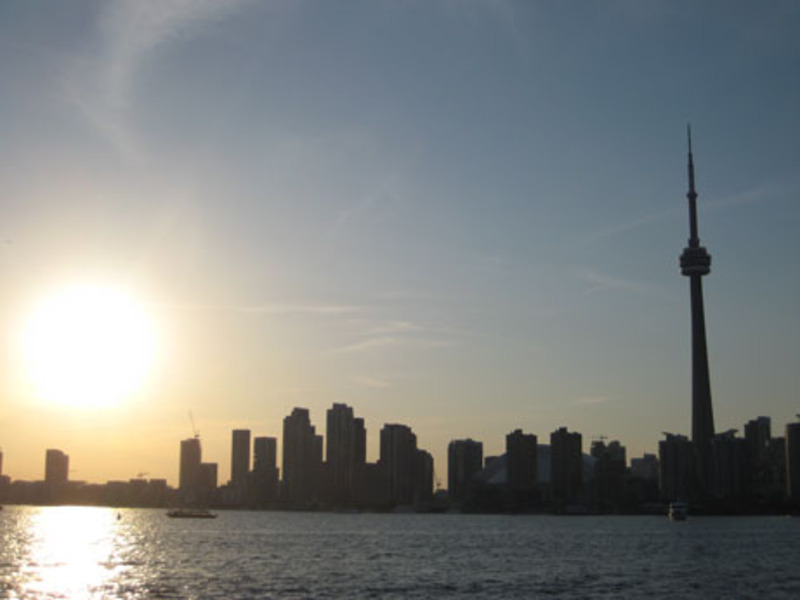 His haibun often refers to his loved ones (wife, daughter and animals) and where he lives on the outskirt of Ottawa. His prose is filled with tenderness and humour. For some obscure reasons, I like doing comics in which the cherry blossoms are MEAN. Last night, our haiku group had a public reading at Chapters bookstore. I was astonished by the talent of the young haiku writers. Their haiku were also displayed on beautiful origami cranes. During the evening, I had a nice surprise when one of the kids (who was told to read the work of his favorite haiku poets) read two of my Old Pond comics. The teacher says she shows my comics in class to help her students learn haiku. I was so pleased!! !